Asya Partan-Tveteraas stood near two of the four pillars that replaced original walls. When Brenda Didonna was house-hunting the last time around, she knew what she wanted: a home where the kitchen, living room, and dining room were one big, uninterrupted space. She got her togetherness, all right, in a glorious new house in Millbury. Now when she cooks and her husband watches TV, he’s in full view. Relaxing. While she works. “Frankly it’s annoying,” she said. A real estate agent has been called. “I miss walls,” she said. But now, experts say, people are starting to openly yearn for walls. “Buyers are moving away from uninterrupted views,” said Loren Larsen, a real estate agent with Compass, in Boston, who is hearing from clients who don’t want their kitchens — and the dirty dishes — on display. That you’re not a parent who wants the kids RIGHT THERE when you’re in the kitchen, your only alone time, or what used to be your only alone time. That you’re not a host relaxed enough to chat with guests while preparing a three-course meal. That you’re not Marie Kondo enough to keep every inch of what used to be three rooms clutter-free at all times. Pantry items were stored on the dining room table, right, while a new wall and cabinets were being constructed off the kitchen. A headline on a 2018 piece in CityLab, a site focused on issues facing metro areas, captured the mood. 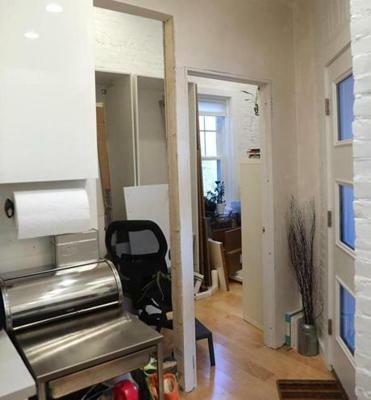 “It’s time to end the tyranny of open-concept interior design,” it read. Author Kate Wagner, an architecture and design critic, said readers thanked her for giving them a voice. “They didn’t know others felt the same way,” she said. Oh, open concept, how you seduced us, made us believe that the fault is not in ourselves, but in our walls. Without them, we’d be free to soar! 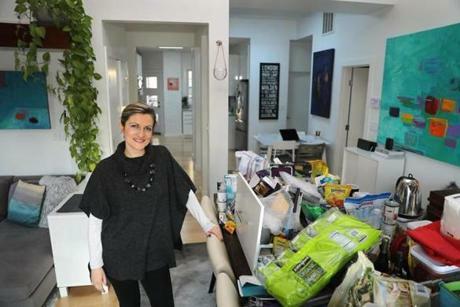 With a sophisticated lifestyle dancing in her head, Asya Partan-Tveteraas and her husband removed the separating walls in their main living space when they were renovating their new Brookline condo. Asya Partan-Tveteraas next to her pantry items, which are stored on the dining room table while a new wall and cabinets are being constructed off the kitchen. With its high ceilings, gorgeous exposed brick, and Scandinavian furniture, the condo does indeed feel like a cool New York loft. If you’re not the one who lives there, that is. <?EM-dummyText p> RELATED: What is KonMari and why are people folding their shirts weird? Unless the couple’s two school-age children are in their rooms, the couple can’t watch a (non- PBS Kids) TV show, have a neighbor over for a drink, or conduct a work call. A closed pantry with shelving units is being constructed off the kitchen. In a slight reversal of the open-concept trend in home design, Asya Partan-Tveteraas and her husband are putting up a wall in their Brookline home, some years after a remodel. “Hashtag OpenConceptRemorse,” Partan-Tveteraas said, by way of explaining why they’re now spending thousands of dollars to put up new walls and are considering pricey sliding doors. 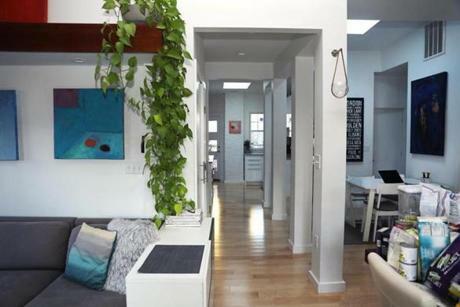 Others get seduced by the fantasy of living in a pristine minimalist space — per every photo ever taken of an open concept home — only to forget that when your first floor is one room, there’s no place for clutter to hide. Scholarly studies on wall-free living, and what it means for family relations and TV consumption, are hard to find. But researchers have looked at what open space means in the workplace, and home buyers might want to take note. “It’s Official: Open-Plan Offices Are Now the Dumbest Management Fad of All Time,” read the headline of a 2018 Inc.com story. It reported on a Harvard study that found open offices kill teamwork, and the lack of privacy drove employees to wear headphones and correspond electronically rather than talking face to face. Better hope you don’t have an open floor plan there, too. Want more home-related content? Check out realestate.boston.com.